Boxcutters, Jigger, Mixing-glass, Muddler, Citrus Juicer, Strainer, Stirrer (long Spoon), Wine Glass. 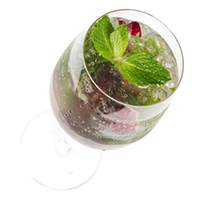 In a Mixing-Glass, muddle the Mint leaves with 6 Halved Grapes, Lime Juice, and Simple Syrup. Add the Rum and stir. Pour into a Wine Glass, add crushed ice and top off with Sparkling Wine. Stir gently from the bottom up. Garnish with remaining Grapes and Mint.